Thousands of books have been written about the latest and greatest diets that will help people lose weight and improve health. But a key element in any successful nutritional health program is a tried-and-true method that most people haven't thought about—yet it could be revolutionary for taking... read more health to the next level. This ancient secret is fasting. Fasting is not about starving oneself. When done right, it's an incredibly effective therapeutic approach that produces amazing results regardless of diet plan. In fact, Toronto-based nephrologist Dr. Jason Fung has used a variety of fasting protocols with more than 1,000 patients, with fantastic success. In The Complete Guide to Fasting&nbsp;he has teamed up with international bestselling author and veteran health podcaster Jimmy Moore to explain what fasting is really about, why it's so important, and how to fast in a way that improves health. 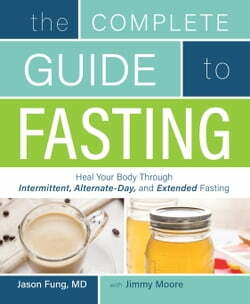 Together, they make fasting as a therapeutic approach both practical and easy to understand.